Credit: Schmidt Ocean Institute. Download this image (JPG, 456 KB). [16-Oct-16] A CTD and water sampling system rosette is prepared for deployment on the R/V Falkor. 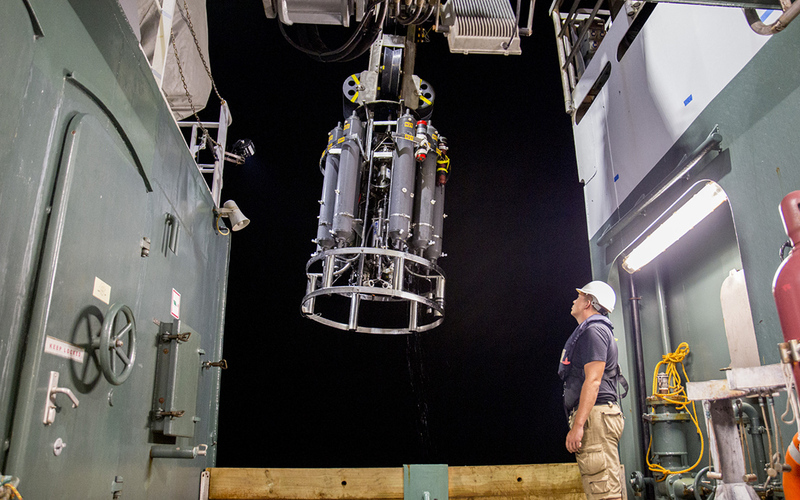 As an oceanographic research vessel, the R/V Falkor hosts a variety of instrumentation and tools for measuring biological, physical and chemical oceanography. The "Sea to Sky Particle Investigation" cruise will utilize a suite of traditional instruments as well as a prototype instrument to observe phytoplankton particle size distributions in the Pacific.